If you view the LinkedIn website from a mobile device like an iPhone or Android, the mobile version of the website will display by default. If you want to view the full version of the website, you can with these steps. Tap the In menu button in the upper-left corner of the screen. A menu will appear where you can scroll down and select “Full site“. Some browsers will save this setting and will always display the mobile version of LinkedIn. 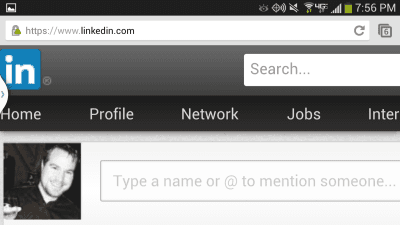 If you ever decide you want the mobile version of the site again, visit type touch.linkedin.com in the address bar. If possible, I recommend the Chrome browser for iOS or Android for viewing non-mobile versions of websites. 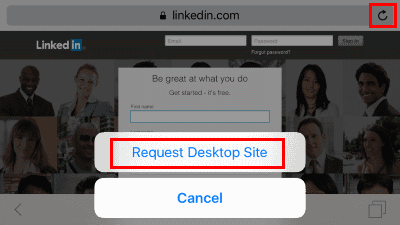 The app has a quickly available option from the Menu that allows you to select “Request desktop site“. If you like to use the Safari browser on your iOS device, you can view a desktop version of LinkedIn using it. Login to the mobile version of LinkedIn on your device. Perform the following steps depending on the version of iOS on your device. iOS9 – Tap and hold the circle arrow icon at the upper-right corner, then select “Request Desktop Site“. iOS8 – Tap the address bar. The URL will become highlighted and the Bookmarks list will appear. 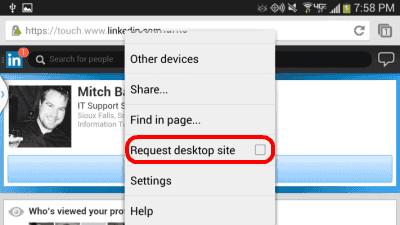 Starting just below the address bar, swipe down, and select the “Request Desktop Site” option. Microsoft is a subversive organization hell-bent on making your day difficult…its impossible to navigate one of their sites and forget about receiving ANY customer assistance! How can I get in to my account if my email changed and I can’t get the verification code? I have my user name and password. Do you have any help for me? The mobile view is on my laptop. I don’t know why it switched from desktop to mobile… and I don’t know how to switch it back. I really want the desktop view back. LinkedIn, and others, just need a different node, like dt.linkedin.com which avoids all the experimental rubbish that Web designers think is brilliant. You are correct Rob. The Site is a mess. Forget about Full Screen. There is a new user interface just installed in which even the Linked In CEO has called a piece of junk. They must really want users to switch to Facebook. Not only is their Customer Service Garbage, but their idiot Software team can never install anything correctly. Folks were warned a few months ago to export their contents. This company could care less about its users. Always was able to go to full site on my Android via option 1 above, but lately a blue searchbar is the only thing I see at the top. When clicking on it, it only refreshes the page. No possibilities to go to any other page. Anyone else dealing with this issue and knowing how to solve it? Thank you so much for teaching me about “request desktop site” … hallelujah!